Very happy with this table! Perfect for seating 4 people and works as an additional work surface in our kitchen. The shipment came in on time and well packed with no damages. Installation was fairly easy, 5 pieces total and 11 screws. The metal legs have a nice weight and feel sturdy. I was pleasantly surprised that the wood top was solid and stained rather than a veneer. The coloration is true to the picture. Add a touch of edgy industrial style to your home with the Arbor Counter Table. 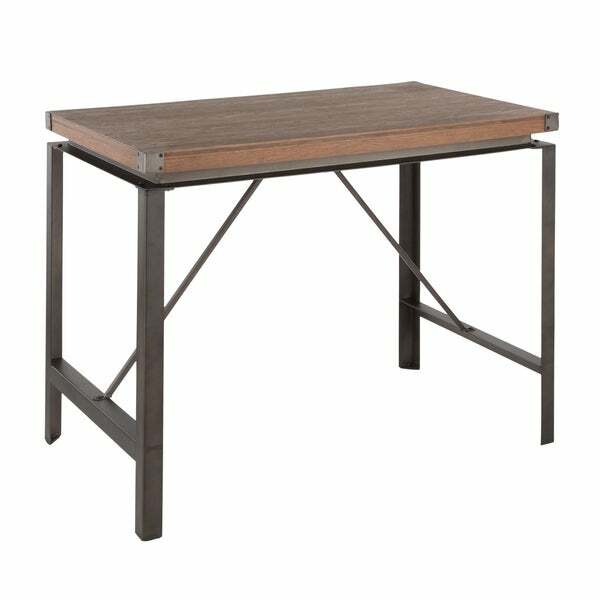 The unique design embodies architectural character and the versatile use make this piece perfect for a dining or office area and even great for extra counter space. The combination of sturdy metal and distressed wood provides a pleasing contrast that will look great in almost any area. Dimensions 28.0 In. X 48.0 In. X 36.0 In. "What is the wood used for the table top?" This features wood-pressed grain bamboo.